The three-time gold medallist, ranked fifth in the world, stamped their dominance pumping seventy six goals in their five pool matches to top their group. JAKARTA: Going by the performance so far defending champion India starts as overwhelming favourites when they take on Malaysia in their semi final clash in men's hockey competition in The Asian Games here on Thursday. This included a runaway 8-0 bashing of Japan and a 5-3 win over four-time champions South Korea, albeit with some tense moments. However, not much should be read in the annihilation of minnows Indonesia, Hong Kong and Sri Lanka as the business end commences now. Even though India have lost to Malaysia a few times in the recent past, they have been beaten once in ten encounters at the Asian Games. That memory of the semi final loss at Guangzhou eight years ago is still fresh in the mind of coach Harendra Singh who tendered his resignation thereafter. Malaysia had stunned India with a 75th minute golden goal from dragflicker Muhammad Amin Rahim after being locked 3-3 in regulation time. India is fully aware that their recent showing against the world's twelfth ranked Malaysians has not been encouraging having been beaten twice last year, first in the Azlan Shah Cup at Ipoh followed by the HWL semi final at London. However, their last encounter was earlier this year at the Azlan Shah Cup where Sardar Singh led an experimental squad to a 5-1 win. While skipper and custodian Sreejesh is the rock, the squad has a quicksilver strike potential with Akashdeep Singh, Mandeep Singh, SV Sunil and Dilpreet Singh assisted by the overlapping midfielders Amit Rohidas and youngster Vivek Sagar Prasad. 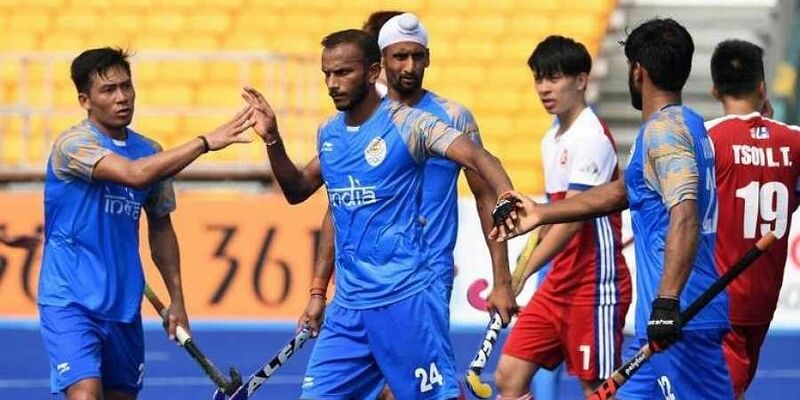 Sardar Singh, the gold medal winning captain at Incheon now playing his third Asian Games and a veteran of 317 international caps will be the principal playmaker in tandem with Manpreet Singh, while Rupinderpal Singh and Harmanpreet will shoulder the responsibility of penalty corner conversions. The Indian onslaught prowess could be blunted by the very experienced 38 year old Malaysian goalkeeper Subramiam Kumar starring in his fifth Asian Games. Their squad has a wealth of experience in the form of captain Sukri Mutalib, flicker Razie Rahim, the Saari brothers Faizal and Fitri, Nabil Noor with strikers Tengku Tajuddin and Muhammad Shahril all of whom have played well over 200 internationals. "We are prepared for the match, it is very crucial for us" said coach Harendra singh," Malaysia is a very strong team and we know that, It is going to be tough. The coach, however, exuded confidence that "boys will live up to the expectations of the country and will emerge winners" Malaysia finished second to Pakistan in the pool matches succumbing to the eight time champions 1-4 in their final round robin game scoring an overall of 41 goals. The other semi final will be between Pakistan and Japan who edged out South Korea to make the last four. Pakistan under former India coach Roelant Oltmans appears to be quickly transforming and orchestrating them into a cohesive unit after sinking into depths of despair in the last couple of years. Though they were not on the podium at the Gold Coast Commonwealth Games this April they had the satisfaction of remaining unbeaten. After an erratic show at the final edition of the Champions Trophy at Breda earlier this year, they have shone brightly in the preliminary stage at Jakarta firing home 45 goals conceding once to Malaysia. Japan has never beaten Pakistan in the Asian Games but overcame the four time world champions twice at Muscat in February. Japan have been eight time semi finalists but it has been a twelve year hiatus for them this time. Their best has been back to back bronze medal finishes at Bangkok in 1966 and 1970.